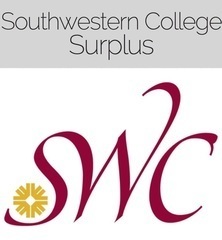 CA1802– – Southwestern College Surplus – Laptops, Electronics, Building Supplies, Janitorial & More. AUCTION CLOSING DATE: Tuesday December 11th beginning at 10:37 a.m PDT Bidding closes the first item at 10:37am PDT then closes 4 items per minutes thereafter to the last item in catalog order. REMOVAL: Thursday December 13th 8:30am – 3:30pm and Friday December 14th 11:30am to 3PM DOORS CLOSE PROMPTLY PLEASE PLAN ACCORDINGLY .